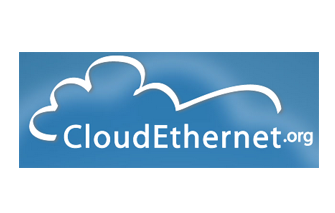 A new CloudEthernet Forum has been established to address the specific issues of scaling and applying suitable Ethernet services to meet the stringent demands of delivering cloud services. The CloudEthernet Forum aims to provide a framework for industry stakeholders to collectively develop solutions that address technical challenges such as VLAN scaling, layer 2 performance and resilience across very large domains and consolidating storage network technologies onto Ethernet. The goal is to enable cloud service providers, carriers and enterprises to quickly and simply build and manage very large amounts of computing and storage capacity to meet the rapidly changing localized performance, scalability and regulatory requirements of cloud services. The founding members of the CloudEthernet Forum include: Alcatel-Lucent, Avaya, Equinix, HP, Juniper Networks, PCCW Global, Spirent Communications, Tata Communications and Verizon. The CloudEthernet Forum is an MEF organization but will operate independently. New members such as systems integrators, NEMs and service providers, including leading cloud providers, are encouraged to join. "Establishment of the CloudEthernet Forum is a reflection of Ethernet's critical position in the future of the communications industry," says Ihab Tarazi, chairman of the board of the MEF and vice president of product technology at Verizon. "Ethernet is ideal for delivering dynamic high speed bandwidth for public and private clouds with reliability, scalability and high performance." Internet2 has established a direct peering relationship with two Microsoft cloud services: Windows Azure and Microsoft Office 365 Education. These services will enable unmetered access to both the high-performance computing and the communications infrastructure to aid collaboration. 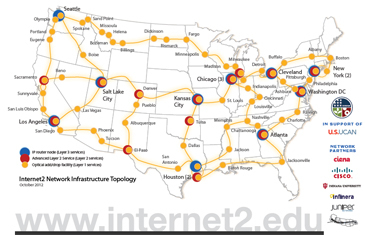 The move to privately peer the Microsoft data centers to the Internet2 Network eliminates the need to traverse these very large data sets over the public Internet. “Microsoft and Internet2 have agreed to establish direct peering to leverage the nation’s fastest research and education network in bringing the power and diversity of Microsoft cloud services to the entire education and research community,” said Shelton Waggener, senior vice president, Internet2. 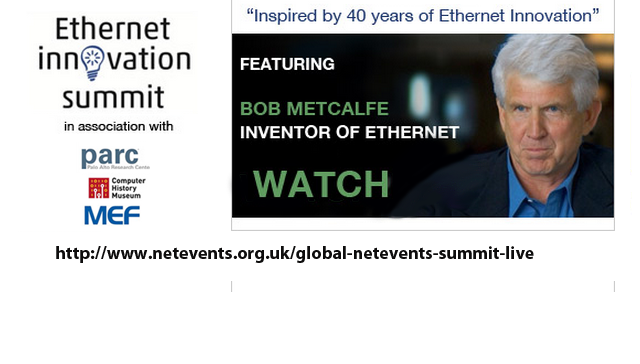 May 22nd marked the 40th anniversary of the day Bob Metcalf sketched out the basic concept of Ethernet. 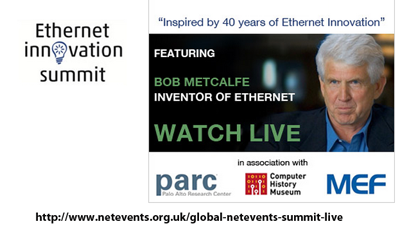 The anniversary was marked in commemorative event at the Computer History Museum presented by the Metro Ethernet Forum (MEF), parc and NetEvents. In this video from NetEvents, Bob Metcalfe, UT Austin Professor of Innovation and Ethernet co-creator, sets the scene with reflections on how CSMA emerged from Hawaii, the early choices and challenges, and some ongoing implications of Metcalfe’s Law. BT conducted a series of trials of 100, 200, and 400G, as well as an "800G super-channel," using equipment from Ciena. The trials, which occurred in March 2013, ran over a 410 km network link between BT’s Adastral Park Research and Development Centre in Ipswich and the iconic BT Tower in Central London. The link used high Polarization Mode Dispersion (PMD) fibre, which was unsuitable for traditional 10G operation but supported the higher rates due to Ciena's WaveLogic 3 transceivers, 6500 Packet-Optical and 4200 Advanced Services platforms. BT said that for one trial, 400G of traffic was carried and monitored over the network using 16QAM modulation, and operated flawlessly alongside adjacent 40G and 100G QPSK-based wavelengths, reinforcing the smooth migration path offered by Ciena’s coherent technology. "BT has always been a pioneer in the field of networking, and we can trace our roots back to the very first national telecommunications undertaking in the world – The Electric Telegraph Company. Since then, and with the recent explosion in global connectivity, we have constantly looked for new ways to future proof our infrastructure and provide more bandwidth for the next generation of applications and services. These trials prove that we’re heading in the right direction, and we’re very proud of our role in this latest milestone in the history of communications,” stated Neil J. McRae, chief network architect at BT. carriers who will have an opportunity to deploy into newly eligible areas. The FCC also adopted a process to challenge the eligibility of particular census blocks, establish two different per-location support amounts based on the existing level of Internet access ($550 for homes with low-speed Internet access and $775, as in the first round, for homes with only dial-up access), and make certain other rule changes to encourage participation and ensure accountability and oversight. A new National Photonics Initiative (NPI) has been established with a mission to advance areas of photonics critical to maintaining US competitiveness and national security. 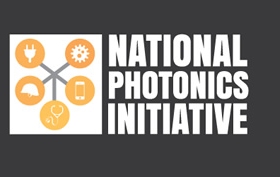 Backers of the NPI include the American Physical Society (APS), IEEE Photonics Society, Laser Institute of America (LIA), the Optical Society (OSA) and SPIE, the international society for optics and photonics. Specifically, the NPI was established to raise awareness about photonics and the impact of photonics on our everyday lives; increase collaboration and coordination among US industry, government and academia to advance photonics-driven fields; and drive US funding and investment in areas of photonics critical to maintaining US competitiveness and national security. The first accomplishment of the NPI is a whitepaper with to guide government funding and private investment in five key photonics-driven fields: advanced manufacturing, communications and information technology, defense and national security, health andmedicine and energy. The group sees opportunities in 3-D printing, more efficient solar power, improved nuclear threat identification, more accurate cancer detection and the growth of Internet speeds and capacity. "The EU, Germany, Korea, Taiwan and China all recognize the importance of photonics, and have taken action,” said SPIE CEO Eugene Arthurs. “The Department of Defense, for example, has long supported photonics, and we have seen the advantage provided to our troops. But now more photonics research is needed to maintain our national security in the face of growing non-traditional threats. The time is now for the US to make the right investments in the crucial capabilities of the future." "Our objective is to direct funding intelligently to research, implementation, education and training, with the ultimate goal of restoring US competitiveness, thereby improving our security, our economy and our quality of life," said LIA Executive Director Peter Baker. Mavenir introduced a Unified Access Gateway (UAG) for converged core network services across Circuit Switch (CS) and IP Multimedia System (IMS) networks. The UAG is a standard IMS Session Border Controller (SBC) that supports the latest 3GPP features needed to introduce new services such as RCS/RCS-e and VoLTE services, including SR-VCC. It employs IMS Centralized Services (ICS), which connects legacy CS GSM/UMTS access networks directly to the IMS core network. Additionally, it is a WebRTC Gateway that supports network services, web APIs and media mixing needed to extend IMS-based services to the web. Finally, it is also an ICS GW that supports the network services and service interworking functions needed to support GSM/UMTS devices from IMS. Mavenir said its UAG will enable mobile operators to simplify and consolidate their networks, and enables them to increase investments in the IP based networks, reduce investments in legacy 2G/3G core networks while serving their 2G/3G subscribers. 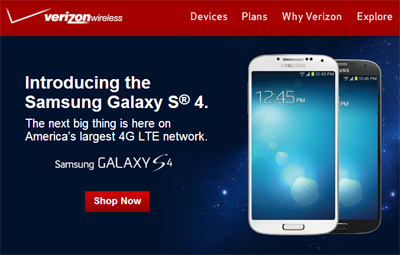 Verizon Wireless announced availability of the Samsung Galaxy S4. Pricing is set at $199 with a new two-year contract activation. Key features include LTE connectivity, 13–megapixel camera, 5–inch full HD display, built–in infrared sensor, Android 4.2 Jelly Bean, etc. Separately, Samsung confirmed that the Galaxy has reached 10 million units shipped in its first month of availability. ARSAT, a state-owned telecommunications operator in Argentina, will upgrade its network to 100G using Alcatel-Lucent’s Agile Optical Networking technology. The first routes to be upgraded are Buenos Aires to Mendoza, and Río Gallegos to Ushuaia in the south, crossing the Magellan Strait. 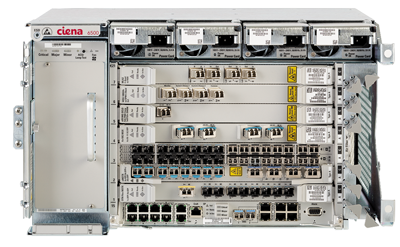 Under the US$7.3 million contract, Alcatel-Lucent will supply 40G and 100G DWDM technology on its 1830 Photonic Service Switch (1830 PSS) platform as well as the 1350 Optical Management System. Alcatel-Lucent will also provide its leading project management services as well as training and technical assistance for five years.